Now it is possible to give little more customization to Galaxy Gear and all credit goes to developer “lilstevie”. Up until now, while it was very much possible to change an Android Phone’s Kernel as we deemed please, it was not much of a possibility on the Galaxy Gear. All that has changed now, by changing Kernels, you can now enjoy a higher grade of customization on your Galaxy Gear. This new kernel, supports two processor cores working simultaneously. Users should also take note, that the kernel will only provide them with Root privileges. Make sure the Re-Partition box is NOT checked. Turn off your off your Galaxy Gear. Press the Power button for several seconds. You will see a first screen “Samsung Galaxy Gear” show, then a black screen and finally a “Samsung Galaxy Gear rebooting” screen. At this time, and only at this point, you can release the Power button. Then press repeatedly (5-6 times) the Power button to bring up a black screen. A few seconds later, a new menu will then emerge with three distinct choices: Continue Download or Recovery. Continue allows you to restart the watch conventionally. In our case, we will choose Download. To navigate the menu, just make short presses on the Power and so proceed to the next option button. When the download is highlighted in blue, you have two options: you can press for 3 seconds the power button to select and then wait a few seconds. Whatever solution is chosen, the result is the same. Now that you have spent your Galaxy Gear mode Download, you must place it in its caseload, supplied with the unit. Connect then (and only now) your watch to the computer via the USB cable. ID box: COM then turns blue (this may take 10 seconds). Once that is the case, press the button Start. Do not touch anything from now on, the operation is in progress. Installing the new kernel is then performed on your device and only takes a few seconds. Once it is completed, the Galaxy Gear restarts itself and you will be in the presence of the new kernel. 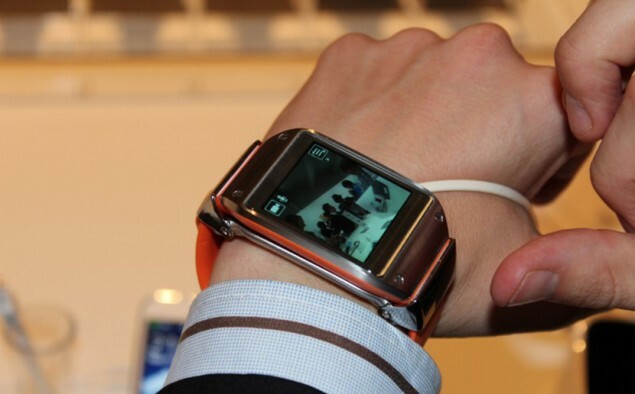 Samsung Galaxy Gear Smart Watch Officially Unveiled – IFA 2013, Berlin.